Backlinks have ruled the SEO industry for over a decade now. Although the tactics have changed, the backlink still has the biggest impact on Google rankings. 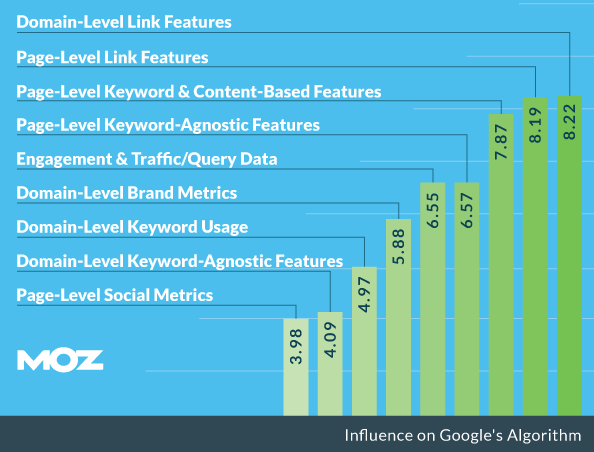 MOZ’s 2015 study of the top factors that have the biggest influence on the Google algorithm revealed what most already knew. With a scoring system from 1 (least impact) to 10 (most impact), domain level backlinks and page level backlinks ranked number one and two on the list. This month, Nicholas Chimonas joined up with Moz to do an extensive survey on the state of linkbuilding industry. The people that they surveyed had the actual job title of “linkbuilder specialist.” All they do is build links 365 days a year. I will be sharing some of the most interesting findings of this survey throughout this post. To start off, let’s take a look at the tactics that the pros use on a regular basis. While there are many ways to get links, content reigns over the kingdom of linkbuilding. It is not just any content. It is content that is framed the right way and delivered to the perfect group of people. So, let us get right into the ten keys that will compell reporters, bloggers, and webmasters to link back to your piece of extraordinary content. When you’re trying to improve or establish links to your site, one of the first things you must do is look at the subject material of your content. You must choose a specific subject for your content to be considered valuable by readers. If you’re running a blog about coffee mugs and you create a post that talks about the benefits of square dancing, then the two don’t necessarily relate – though you may need some coffee to have the energy to do some square dancing, right? You must be able to stay within your niche. A blog talking about coffee mugs needs to let people know about awesome coffee mugs, how they could be made by hand, or how to properly care for them. Far too often, the content that gets published is actually too generic for it to be considered valuable by readers. Generic content rarely generates a link. When it does, then it is even more rare for it to have any authority. You can write a long piece of content that has numerous awesome points. The amount of valuable information it has could help run an entire day’s worth of webinars as a training tool. Your content can’t just include great content, although that’s a good start. You must take the next step on your journey. Your content must also be easy to digest. People don’t sit at their computer to read long-form content. They won’t scroll through a long piece of content on their tablet or smartphone. What they will do is pick and choose the content that is most meaningful to them. This is what will help to generate authority backlinks. How can you structure your content so that it becomes easy to digest? There are three basic methods that tend to work right right. Separate key points out of the subject material with bullet points. Use strategic h2/h3/h4 headings with keyword-specific content. Create lists that have each key point highlighted and then provide evidence to support that key point. Modern content doesn’t have the goal to have readers digest all of the content – though you can’t ignore the readers who actually will read thousands of words in a single setting. The goal is to create specific bits of data that are easy to understand and implement so that others will want to link to them. In order for links to be generated, you’ve got to find a way for your content to be shared with others. This doesn’t mean your content needs to go viral in order for it to be effective. As long as the structure of the content is suitable for sharing, you’ll be inviting authority links to come your way. How do you structure your content so that people will want to share it? The easiest way is to create content that is based on lists. You see these content posts published everywhere. Going back to the survey that I mentioned at the beginning of this article… Here is the breakdown of what businesses are paying for linkbuilding on a monthly basis. Now that we’ve talked about the content structures and making everything easy to share over social networking, it’s time to actually improve your content. People click on content to read or view because it has what is called a value promise. A value promise tells the reader that if they spend time looking at your specific content, their lives will be better for it in some way. In basic terms, this means your content must be able to solve some sort of problem for the reader. It must be able to save them time, save them money, or make their lives easier in some way. If there is a specific promise made within the introduction of the materials, then that promise must be fulfilled in the content. Because almost all readers scan content first, you must confirm your value proposition not once, but twice. The content that gets scanned must speak to the promises made in your headlines and summaries. This could be your bullet points, your subheadings, your introduction – there really is no telling what part of the content a reader will emphasize. Then the main body of your content must be able to confirm the promises that were made. At any point this doesn’t happen, you’re going to lose the chance to generate authority backlinks. If you do confirm the promise, there still isn’t a guarantee that you’ll get a link. The odds, however, will be much better. You’ve created some awesome content. It’s grammatically correct, structurally perfect, and you think it’s the best thing you’ve ever written. Now it’s posted on your site and you sit back, hands locked behind your head, with a huge smile on your face because the visitors are going to come. That means the links are going to come. And then nothing happens. You get 14 unique visitors and all but one of them bounces from your content that now seems not-so-awesome in nature. What happened? People shop with their eyes. If your content looks like it might be a difficult read, then most people aren’t going to spend time reading it. Content definitely needs to be “meaty” to be attractive, but the average person can’t eat an entire 72 ounce steak in 10 minutes. They want smaller portions and more sides. This is where the graphics of your content must come into play. If you can create visual components that help to reinforce the points you make within your content, then you will be able to make your content have even more valuable and make it easier for people to want to share it. You make it easier for people to want to link to it as well. There are plenty of options available to you today for your graphics options. Go the traditional route. Charts, graphs, and statistics that are put into a visual format provide your content with instant credibility. Prove your value ratios here and people will want to consume the entire body of content you’ve created. Use infographics strategically. The only content that performs better than content that has a list format is the infographic. That’s because all of the quick hitting points people want to see are within this graphic. If you combine both structures, you wind up with a powerful piece of content that will generate links because it will help others prove their niche expertise as well. Screenshots become a how-to guide. When you take screenshots of the exact procedures you’re talking about within your content, then you are showing readers the specific things they must do to obtain the value you’re talking about. Visuals help readers see the value that can be achieved in a more precise manner. It encourages them to try their value out personally because the steps have been outlined for them. That’s why the best content that will generate the most authority backlinks will have numerous visual graphics, photographs, charts, and videos because these are the real tools that readers use to convince themselves of your value. When the linkbuilding professionals were asked about what the most effective tactics were, this is what they said. The goal here is to generate high authority links to your site that are organic, not paid, so your expertise shines through. Sometimes the best way to this is to create content that makes other people look like more of an expert than yourself. It’s easy to do if you follow these 3 steps to the letter. Step #1: Target the right influencer within your industry. There are plenty of bloggers, professors, senior executives, and industry professionals who are online right now. They’re giving their advice out freely because that’s how they fulfill their value promises. Find the one person who has advice that you can follow right now and implement their plans. Step #2: Apply the advice. Those comments are nice to receive, but they don’t help you get those high authority links. You must become that one comment that really changes the day of the influencer because you prove without a doubt that their strategy works. Take the advice from the influencer, apply it, and then document what happens. Step #3: Share the results. Now it is time to share the results. A quick letter that thanks the influencer for their time and advice is suitable enough. Make sure that you include the results you were able to achieve using their advice. Include the results you were able to receive. More often than not, you’ll find a note or an email waiting for you a couple of days later asking you for more specifics. This can generate a great link to your site. It may also generate multiple links. If you create content regarding your results and discuss how you got the idea from this specific influencer, then there’s a good chance that the influencer will link to your content as proof of their niche expertise. What does this mean for you? That you get ongoing, potentially permanent authority sent to your content because of your industry’s leaders is using your content as evidence of their value proposition. One of the biggest errors that content creators make occurs when they are desperate to generate unique pageviews, organic links, and establish niche expertise. They publish every single bit of data that they know on their subject as soon as they possibly can. The idea goes something like this: I must prove I’m an expert by showing people how much information I already know. Or some variation of that thought. What happens? Pretty soon there isn’t any new content to publish on the subject. The content becomes repetitive and less valuable. There might not even be any new content to publish at all because the available creativity has been spent. Instead of publishing everything you know all at once, leave readers wanting to know more about what you have to share. If you share a recipe, then you’re allowing people to create their own baked goods in the comfort of their own home on their own time. That’s a lot different than creating an entire cookbook of recipes and offering them the entire thing for free. Sometimes there is more value in simple, immediate results. You will typically create more authority backlinks if you publish single pieces of content on a regular schedule instead of one large bit of content that has the same exact content, but not broken up into a usable format. Don’t let your readers have their cake and eat it too. Don’t let them have the cake at all. Break it up into tiny, bite-sized pieces instead to achieve the best results. If you’ve been publishing content for awhile, then you’ve likely experienced some level of burn-out. The amount of creativity that is required for constant content, no matter what format the content might be in, can be quite draining. Every content creator experiences burn-out. Every content creator also needs to have fresh content on a regular basis. That’s why a little bribery can be a great thing when you’re trying to generate authority backlinks. Offer content creators some free content. It could be an infographic, a visual graph, or even a quick hitting 250 words of something useful about your industry. Make it something that is easy for you to create, yet has value to the recipient. Here’s the step that many ignore in this strategy: the content you offer to someone else must be customized for their site based on their expectations for content. Otherwise the bribe doesn’t work because you’re not actually adding any value. Begging people to publish your content doesn’t work. Don’t sound desperate. Just create a value proposition for other content creators as you would for your readers. Be patient. When people get back with you, then nail the content they want in the way that they want it and you’re 99% guaranteed to get the authority link you want. At this point, you’ve likely got some new authority links coming to your site. You’ve created tens of thousands of words in content, created numerous infographics, and offered several tasty pie charts that prove your value propositions. You’ve got readers interested in your content and they are sharing it often. That’s still not good enough. In order for you to sustain your momentum, you’ve got to take the next step on your journey. You must engage with the community that you’ve built on a regular basis. This isn’t the type of engagement where you post comments on Facebook or respond to tweets received on Twitter, although doing that is important. What you’ve got to do is stay up-to-date with the problems that your target audience is encountering on a regular basis. You must keep evolving your content so that your value proposition keeps evolving. Sometimes the problems your targeted community faces can be so new and unique that there are no supporting statistics, infographics, or other forms of content. This means you get to create the content that will become the foundation of value that others will use in the future. This means you’ll need to invest plenty of time and resources to make this happen. In return, you will wind up with plenty of authority links because this type of content holds the most value on the internet today. One article by okdork.com has generated 23,000+ external backlinks by following this strategy. Having valuable data isn’t good enough here. It must also be presented in a way that is interesting and engaging. How do you do that? By following the other strategies listed above this one. There is nothing wrong in implementing an approach that includes multiple strategies at once. The final chart that I am going to share from the MOZ linkbuilding survey lists out the SEO tools that the pros use the most. This really is a strategy. Don’t discount the stress and frustration that comes when you post something that you think is awesome, but you’re the only one who seems to think that way. Not every piece of content is going to strike linking gold. Most content will create a link or two here or there, but that’s about it. Waiting for that one piece that strikes a chord can be a frustrating process. Some creators have waiting months or years for their chances and are still waiting. That’s not said to be discouraging. It’s said to encourage you that when it comes to generating authority backlinks, you should never give up. Don’t surrender to the temptation to find something else to do. You can generate the authority links. It’s also important to realize that not every strategy is going to work the same way in every industry or niche. Sometimes you’ve got to tweak your approach based on information that only you know so that your strategies to generate authority backlinks can work. Think about the types of content that you’ve published in the past. What worked? What didn’t work? Did you make any changes that helped make your content more valuable? Your past experiences are also important to consider, but don’t get stuck in the past. That’s the fastest way to create feelings of failure and wanting to give up. Focus on evolving. Focus on the feedback. You will find the information you need to improve the value of what you publish. These 10 strategies are designed to help you generate or improve the content that you’re already creating. Remember to keep your focus within the content that is being created. Make sure that you’re solving problems for your targeted audience. If you’re creating content for others, then make sure your content is suitable for their site. When a strategy to generate authority links is working well, it’s a beautiful thing. The content keeps working passively to generate more links every day. When you can repetitively publish content over the course of 1-2 years that consistently solves problems, then your results in this area are going to be incredible.